Pisces May 2015 Horoscope shows that your determination and aggression will help you to accomplish your targets. Decide what you want and take necessary action. If the situation is against you, change the situation. It will be your way all the way. 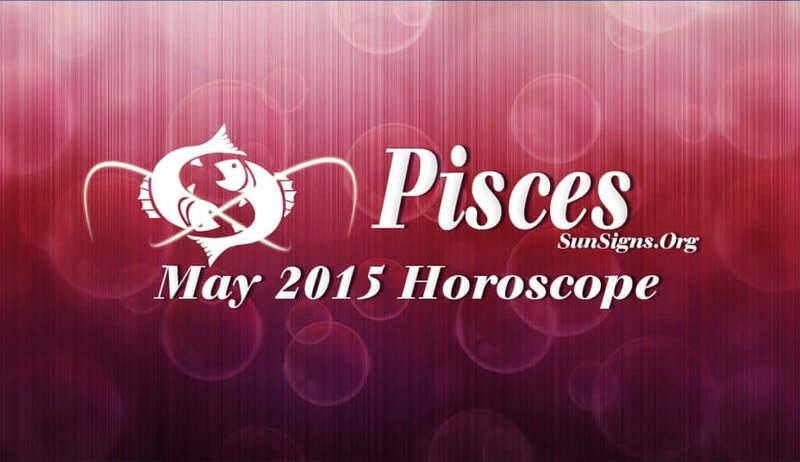 Emotional stability and family affairs will be in the center stage for the Pisceans in May 2015. Career issues are not important right now. Peace in the family is necessary for success in your work at a later date. The Pisces monthly career forecasts for May 2015 predict that progress in your workplace will be slow this month. There is no point in putting unnecessary pressure to move forward. Allow things to take their own time to develop. The financial situation is not very bright, but will be adequate in May 2015. You have to struggle hard to generate earnings. Family expenses will be a drag. Conflicts with your business partners are likely. All major investments should be made in the first week of the month. You have to decide on the fate of current relationships. Singles will find partners in academic fields or close to home. Family environment will be disturbing, but things will get resolved soon. If you are in a long distance relationship, you will need to work harder. There will be some good news of the birth of a child. The May 2015 Pisces horoscope forecasts that health concerns require attention during the month. Avoid stress and focus on mental health. Do not let your moods spoil the quality of your life. Previous Having An Online Dating Profile Video – Good Or Bad Idea?